A manhunt yesterday was safely resolved after police were able to locate a Perry County man who had removed his court ordered home monitoring GPS unit. 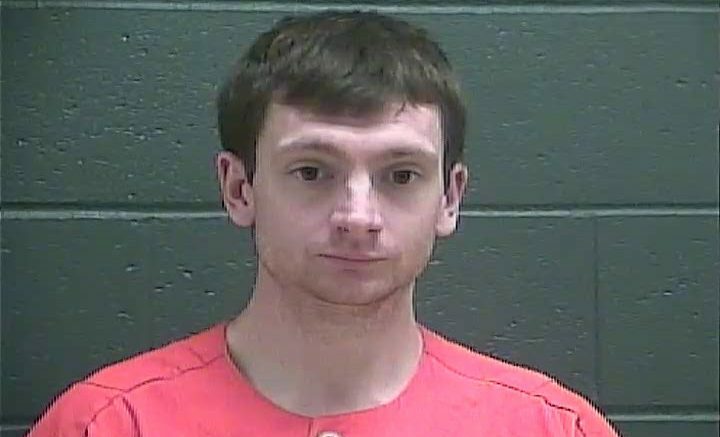 31-year-old David Templin was arrested Tuesday after he removed his ankle monitor device and led police on a brief game of cat and mouse that began in Perry county and ended here in Dubois county. Templin who is facing pre-trial charges stemming from an incident in March in which he allegedly impersonated a public safety official at a home where police were investigating a battery. During that time Templin reportedly told police he was a first responder however was unable to produce appropriate credentials. In the March incident police said that Templin was carrying a handgun in his waistband and found an AR-15, high-capacity clips and a police radio in his vehicle he had arrived in to the scene. Yesterday (April 17, 2018), Tell City Police Dispatch receive a call from the Perry County Community Corrections around 10:22 a.m. that Templin had cut his GPS ankle monitor off. Templin had been on home monitoring with the Perry County Community Corrections program following his March arrest. A warrant was issued Tuesday morning for Templin on Escape, police report that he was known to be carrying a weapon. Tell City Dispatch were able to track his phone and notified neighboring law enforcement that Templin was heading into the Jasper area in a red 1995 Lincoln Town Car. Jasper Police were posted near schools as a precautionary measure. As the manhunt continued fellow agencies assisting in the search included: Jasper, Huntingburg and Ferdinand Police along with the Dubois County Sheriff Dept. and Indiana State Police. While police continued to search the Jasper area Dubois County Sheriff Deputy Wade Pierce located Templin just before 1:30 p.m. near the county highway garage on State Road 162. Deputy Pierce conducted a traffic stop on the ’95’ Lincoln and was able to safely take Templin into custody. During a search of Templin, Deputy Pierce found a 9mm Glock Pistol in his front pant waist band. A further search of the vehicle lead police to locate two other rifles, ammo, camping gear, food and a pet dog. Perry County Sheriff Alan Malone had also been tracking Templins phone and arrived quickly to the traffic stop with other officers scene. Templin was taken back to the Perry County Sheriff Department for further investigation while his Lincoln was towed by Uebelhors Wrecker and his dog was housed at the Dogwood Animal Clinic. Templin was booked into the Perry County Jail and is facing a Notice of Violating Community Corrections along with escape, no bond has been set. The Perry County News reported that Templin had been invited to take part in Thursday’s political forum for sheriff and coroner candidates after he had filed as an independent candidate for sheriff, however is was unclear whether he would be allowed to now take part in that event pending the conditions of his release. Be the first to comment on "Perry County Man Arrested Following Removal of Court Home Monitoring GPS Device"